SILC student attorneys use Circles of Peace as a form of restorative justice focusing on healing and wellness. 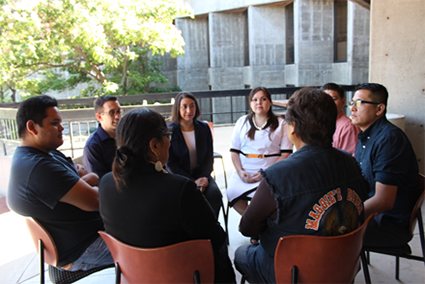 Students in the law school’s Southwest Indian Law Clinic (SILC) have made a number of presentations about the work they are doing in Clinic to tribal courts throughout New Mexico. The presentations explain Circles of Peace, a process of Peacemaking and Tribal Restorative Justice developed under the direction of Visiting Professor Cheryl Demmert Fairbanks (Alaska Native, Tlingit-Tsimpshian). Fairbanks is supervising SILC while SILC Director Barbara Creel is on sabbatical. “The SILC student attorneys as peacemakers have been shifting justice from an adversarial system to one of healing and wellness,” says Fairbanks. E.J. John, Nikki Alex, Concetta Tsosie de Haro and Diego Urbina presented on Peace Circles and ICWA at Isleta Resort.